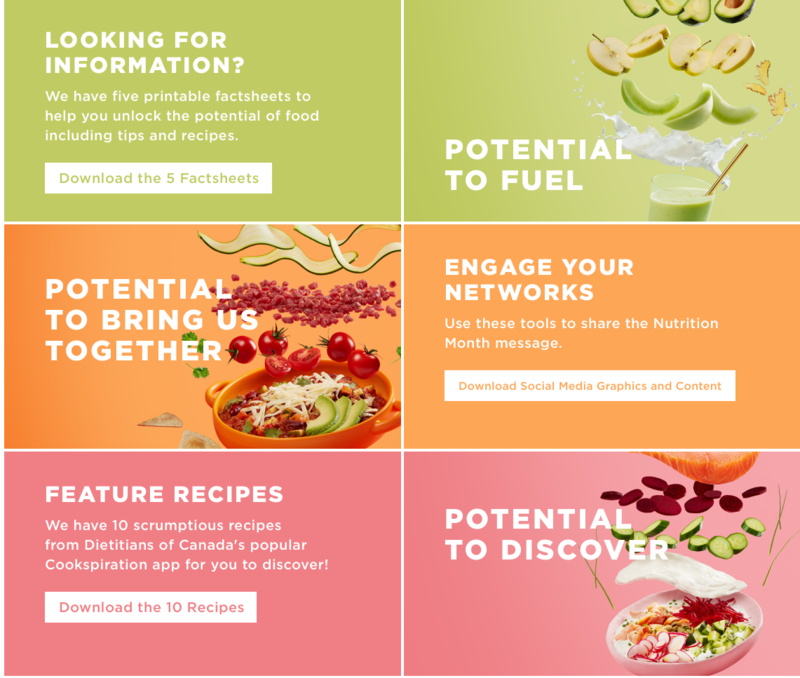 March is #NutritionMonth and to celebrate Dietitians of Canada have produced five colourful, useful and fun fact sheets about unlocking the potential of food. The fifth one in this series is about The Potential to Bring us Together. Shared meal time is something I’ve been thinking about since my oldest child declared a personal strike on veggies. (You can read the blog post on Picky Eating here). If the old adage “you are what you eat” is true than my four year old would be one half crackers and one half cheese. And instead of taking a big-picture perspective on my son’s determination to eat foods that only come in “white” or “processed orange,” my husband and I zeroed in with a razor sharp focus on exactly what he was –and wasn’t- eating during meal times; which as you probably have guessed, unwittingly zapped the joy out of eating for any of us. In The Potential to Bring us Together, Dietitians of Canada recommend putting away any screens, asking open-ended questions and giving everyone a chance to speak during mealtimes. These three suggestions can help bring the focus back to the experience of eating together. It was particularly good timing that earlier this month I had a great professional and personal opportunity to learn about combining food literacy and healthy eating with physical activity for the early years in an Appetite to Play Virtual Workshop. This interactive online workshop was jam packed with practical, engaging ideas on how to facilitate moving and eating. Facilitator Chris Wright took us through some ingenious exercises that were motivating to this harried, battle-tired mom of a picky eater. The first game, Who’s Your Mama?, showed us how to make a connection between the everyday foods we eat and where they come from. This is perfect fuel for the rapid-fire curiosity of a preschooler! The second was a food literacy game called Mystery Foods. The last game, Bundles of Fun, was my favourite. This game creates positive experiences with food that spark creativity AND brings kids and adults together. It has great potential to bring joy back into eating in our home. 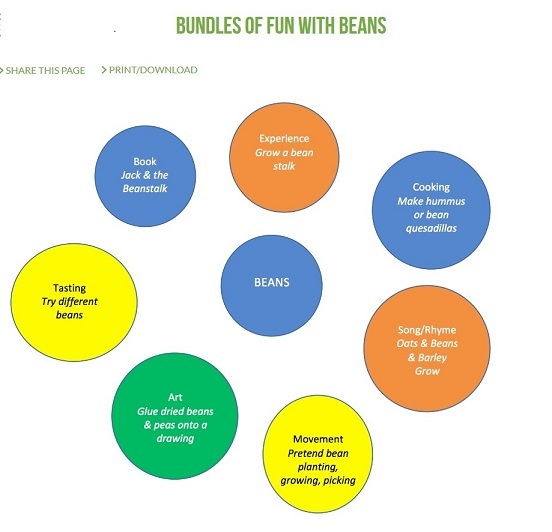 How it works is you take a food, beans for example, and then find a book, a song, a story; an art project, a field trip, an exercise like growing a bean stalk or a movement exercise like acting out a beanstalk growing in the sun before even preparing or tasting the food. The genus is that every exercise you do with or about a food counts as an exposure to that food. It was noted in the workshop that it can take up to 15 exposures to a food before a child is willing to give it a shot. This was new learning to me that an exposure can be a picture, art project, field trip or song rather than having the actual food served up in front of you. #NutritionMonth is an excellent time to take stock of not only what we eat but how we eat and with whom. I will report back later on our household’s food journey as our youngest is now the age when my oldest said adios to peas and carrots. But this time around, I am armed with many more resources thanks to Appetite to Play and Dietitians of Canada. Plus I have a new focus: the joy of being together during meals. In the meantime, here are two excellent resources from Dietitians of Canada: Top 10 tips for picky eaters and Picky Eating: 10 Fun Tips to Get Kids to Try New Foods.